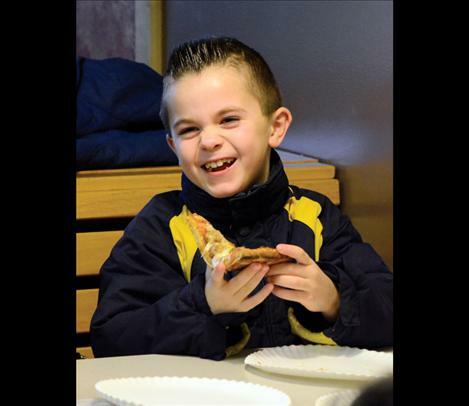 Sawyer Pule, 7, enjoys lunch at Cornerstone Pizza in St. Ignatius. ST. IGNATIUS – Free lunch was a reality at the Cornerstone Pizza shop on Christmas Eve where slices of pizza were going fast. Tammie Cappel brought her family to the free pizza lunch. Cornerstone Pizza started as a nonprofit business three and a half years ago. The profits have gone to several projects including the Mission Elementary School’s playground fundraiser and to individuals in need. The shop also supports the community by creating jobs. Delivery service and 8-inch cookies are the newest things at the shop. Six teams with two people on each team have volunteered to rotate throughout each month to deliver pizzas on Fridays using their own vehicles and insurance within a 5-mile range of the pizza shop. Delivery drivers can also meet people outside of town. Stacey and David Doll volunteered to deliver pizzas as a way to get involved with the community. “This gives us an outlet to get in touch with people,” Stacey said. The delivery service is keeping with the pizza shop’s theme of pizza with a purpose, which is to give back to the community.